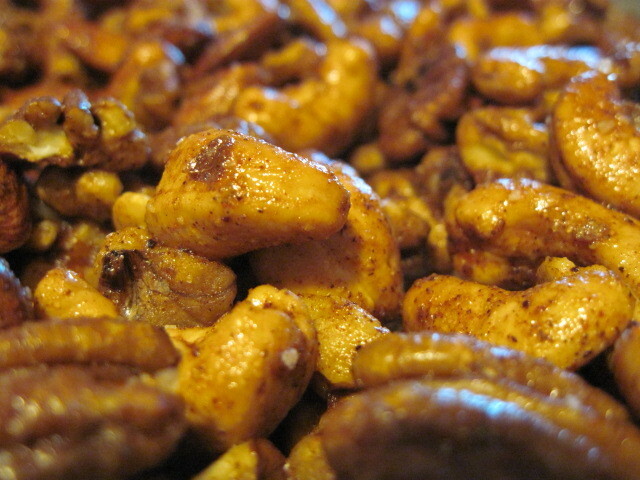 I’m nuts for nuts!!! Always have been, probably always will be. When I saw this recipe was chosen for December I was very excited. Now I can actually make them AND store them away for all of our holiday gatherings instead of me eating them all myself (something I would otherwise do). This recipe was fast and easy although a bit costly (at least for the amount I made). 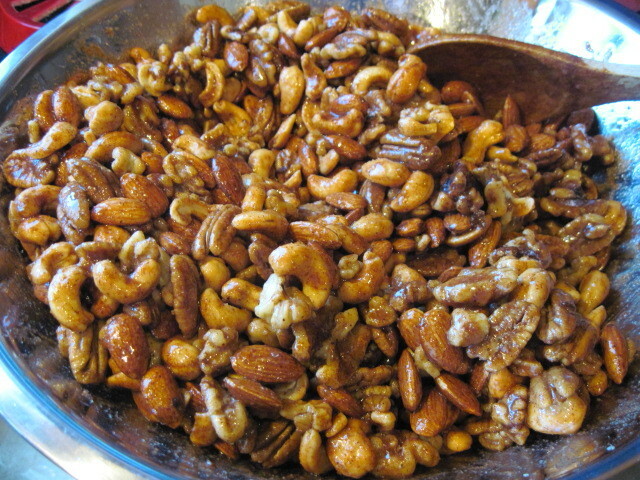 As a frequent shopper of Costco, I purchased all my nuts there and used a combination of cashews, pecans, walnuts and almonds. Anybody want to play a game of “Where’s Waldo” in the below photo? Oh, I also added some additional ingredients that the recipe didn’t call for (you should know me by now). My additions were: a sprinkling of brown sugar, some smoked paprika, some smoked ground cumin and some fresh grated nutmeg. Is that be so wrong??? I think not! Baked in a relatively low oven for approximately 30 minutes has your home smelling like the best corner nut shop in the city (if there were such a thing). 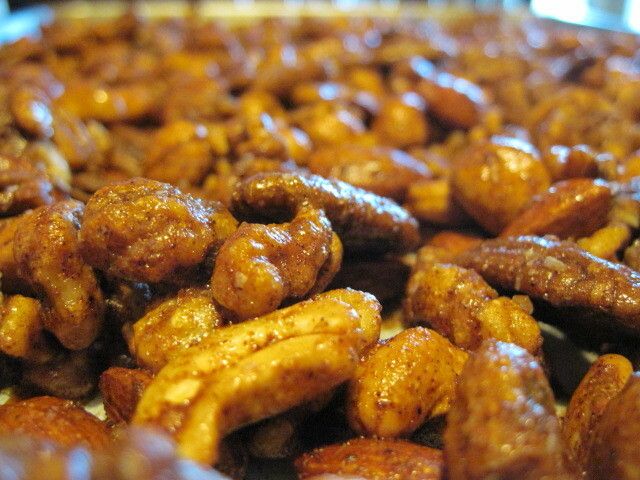 Allow to cool slightly on the parchment lined baking sheets and then break the nut clusters into pieces. Waiting too long to cool your nuts on the parchment (like I did) only leads you to peeling the parchment paper off your nuts when fully cool (and let’s just say that nobody needs to see that)!! Can’t wait to serve these babies at all our holiday gatherings. 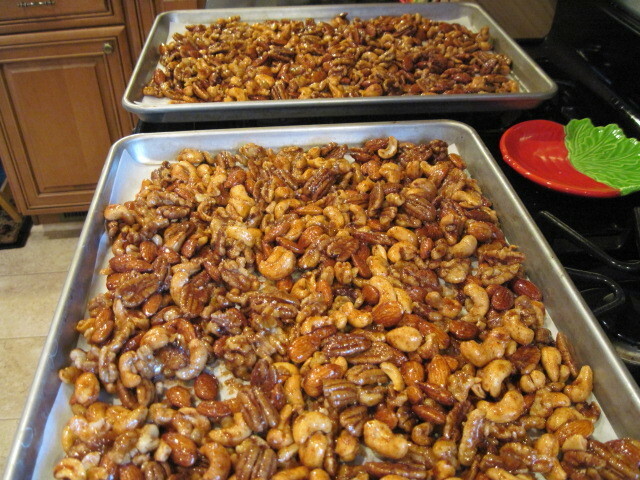 No, let me re-phrase that…Can’t wait to EAT these babies at all our holiday gatherings!!! Please, If you see me hanging around the nut bowl too long, you have my permission to remove me as quickly as possible. I don’t have the will power on my own! I’m all about the nuts!!! These are so very good! 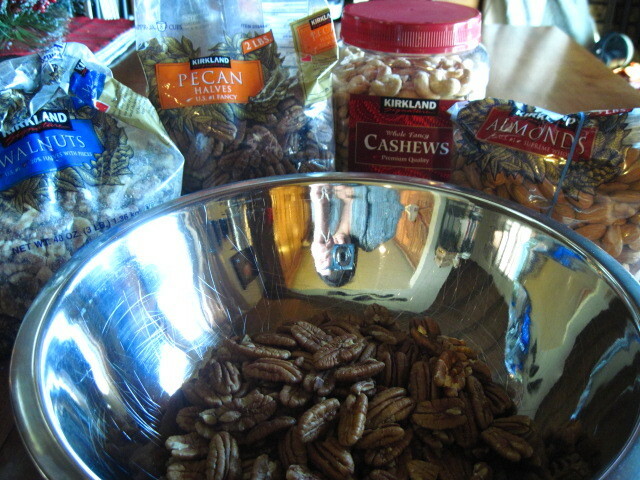 I will have to try mine with some cashews and almonds, I only did walnuts & pecans. Those look really good! I added smoked paprika to mine as well, but the cumin is a great idea. I hid mine in the freezer, out of sight, out of mind….fingers crossed! What will power! To wait until your holiday gatherings to eat these puppies. We are on our second double batch already! Love your "modifications!" 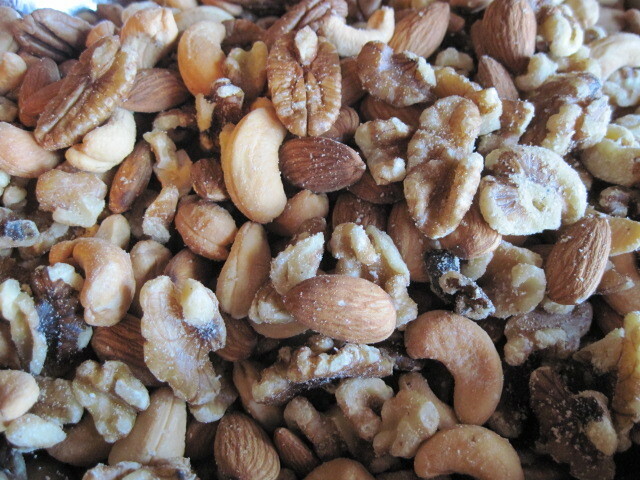 Im nuts for nuts too and man you have a lot of nuts…love the nuts!!! Great job! This recipe definately lended itself to doubling, or tripling! I have GOT to make these. So many rave reviews. Those look fantastic!!! Your house sounds like our house. There are always nuts stashed in the pantry as my husband is a nut lover. I enjoy them (a lot of them at times) but he is like you. It's all about the nuts. Your mixture looks great and it sure would not last long around here. I'm thinking about tripling the recipe, too, but want to use a few different spice combinations. Yours turned out beautifully!